FREE STORE OPPORTUNITY … Its Better than a Franchise! Limited Areas Available – MAILPOST is providing cutting edge promotional print and distribution services to local, regional and corporate advertisers. The unique proposition we offer stands out amongst smaller operators and is unmatched by the larger service providers. 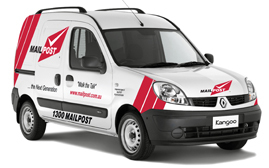 MAILPOST launched its services during the Global Financial Crisis in 2008 with over 600 franchised postal contracts in Australia. An unprecedented growth phase for an Australian business. MAILPOST pioneered the world’s first franchised postal system at the walker level, and incorporating the then latest GPS Technology as a method to provide customers with guaranteed proof of delivery. MailPost was a decade ahead of its time and now its launching MailPost Phase II, the next generation business model has just become the evolution of Print and Post in Australia. During the last six years, MAILPOST has matured it business systems and has abolished franchise fees. This amounts to a great opportunity for the operators joining the MailPost business in its next big phase of Growth. Make no mistake, irrespective to any initial challenges faced by a start up business, MAILPOST was and will be a major player in the Australian Postal arena with plans to setup fully automated Postal Stores across Australia. Our Postal Stores are free to setup for the right individuals and better than a franchise. MAILPOST is an all Australian business that was a brave entrant to an already existing and inefficient distribution network that has existed for decades. We welcome you to explore the possibilities of building the next Australian Postal service together. Our reward and incentive program is more than generous and will delight you. Why do advertisers big and small want to trade with your MAILPOST business? Because you will provide a service unmatched in this industry – these advertisers want the elite quality service that only you can deliver. Your MAILPOST business has the potential to grow in value in the first year, and continue to grow year in year out. We supply training, uniforms, carry equipment, marketing material, computer equipment and everything you will need to take a big share of a big market. Register to attend a one-on-one presentation now!